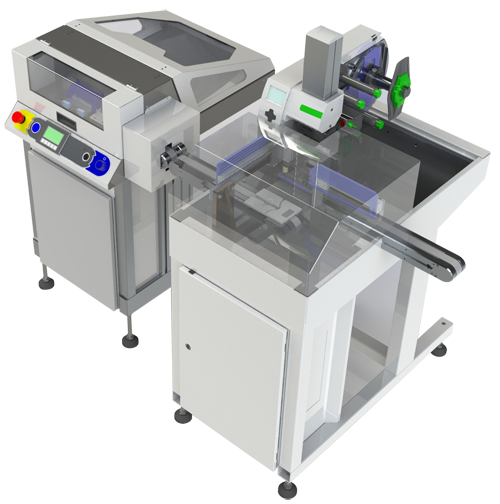 The FLEX Tube Pro incorporates two other standard products of Nautilus Systems, Inc.: the LC100i Tube Pro tube and vial labeling system and the FLEX TVF Tube and Vial Feeder. In addition to these items we have configured other automation including a Tandem Pick and Place Loader System that is used to transfer the Tubes from the output of the FLEX TVF to the Tube Pro module for labeling and then to the output position. The FLEX Tube Pro is built on a welded steel chassis with white powder coat finish. Perimeter guards are mounted on the system as required to ensure the safety of Operators and other personnel. The FLEX Tube Pro uses our PC-based automation system with included HMI panel to provide the operator the interface and controls needed to operate the system.